At Ontario Equestrian, we take safety seriously for both horse and rider. Whether you’re a first-time rider or an experienced competitor, the following links can help you stay safe on and off the horse. 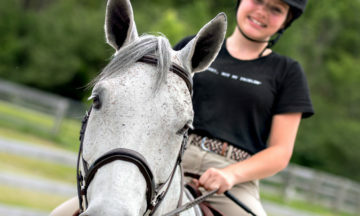 We strongly encourage all riders, new and experienced, to wear an ASTM Certified Equestrian Helmet while riding, and for those who are new to horses it makes sense to wear it while grooming and tacking as well. Our guide reflects the latest research on Concussion Awareness and Return to Play guidelines, developed in partnership with the Coaches Association of Ontario and with advice and support from Holland Bloorview Kids Rehabilitation Hospital Concussion Centre. Do you have biosecurity measures in place at your stable to prevent the spread of infectious diseases? Biosecurity is a crucial, yet often overlooked, aspect of equine management. Horse farms are typically located in a high traffic area, which means steps need to be taken to reduce the chances of an infectious disease being carried onto the grounds or spread within your facility and beyond. The Codes of Practice are the nationally developed guidelines for the care and handling of farm animals and help serve as the national standard of animal care requirements and recommended practices. The purpose of the Code of Practice for Equines is to promote sound management and welfare practices for housing, care, transportation and other animal husbandry practices. The Ontario Animal Health Network oversees a program focusing on early disease detection in animals in order to identify disease and welfare trends and direct the appropriate action when necessary. The Equine Expert Network is comprised of seven veterinarians with representation from the Ontario Veterinary College, OMAFRA, the Animal Health Laboratory at the University of Guelph and from private veterinary clinics representing different geographical regions and disciplines. Veterinarians who provide services to horse owners are surveyed quarterly about the diseases and issues seen in practice. Results from this survey, along with a summary of laboratory results, are discussed by the Network to detect important trends and emerging horse health issues. The overall goal of the network is to improve the health of Ontario’s equine herd.